Do you own property along a BC highway? If you do, you may have some questions about driveway culverts and culvert maintenance. Whether you are constructing a new driveway culvert, or you have a pre-existing driveway culvert that needs replacing or maintenance, it’s your responsibility to make sure it is big enough, installed correctly and functioning properly. Just like many other aspects of home ownership, maintenance is key, especially in the case of driveway culverts. Good culvert maintenance protects roads, properties and the environment. Here’s what you need to know in order to keep your culvert and road access clear. We require that you provide a minimum 400-mm (16-inch) diameter pipe (preferably corrugated steel). 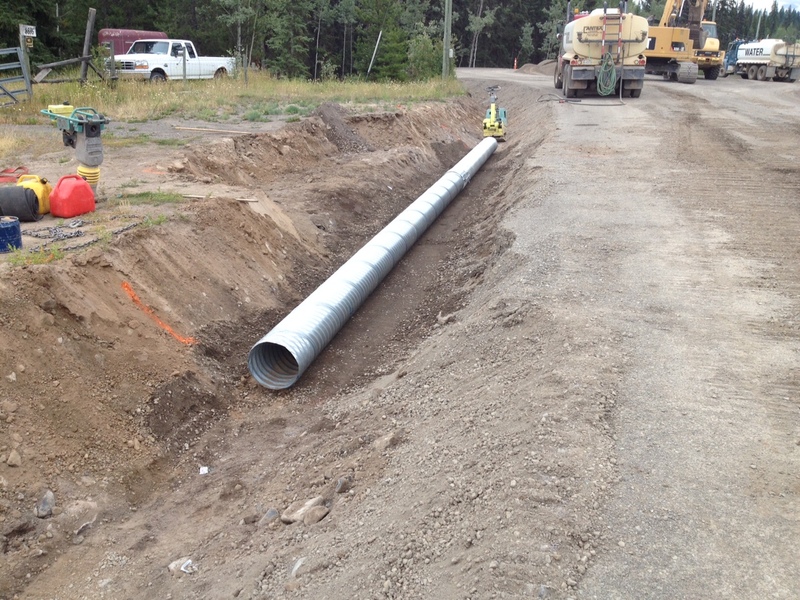 In coastal areas or areas of high rain runoff, a larger diameter pipe will be required. The culvert should be longer than the width of your driveway. The standard residential driveway is six metres (20 feet). The culvert length should be a minimum of nine metres (30 feet) to allow for the driveway fill on either side of the driveway. Culvert pipe (preferably corrugated steel) needs to be a minimum diameter of 400-mm (16 inches) by nine metres (30 feet) in length. Big O plastic pipe can be used, but the construction practices will vary in the installation. The culvert must have more gravel and fill on top of the pipe to buffer it from the weight of vehicles travelling over the pipe. It should be noted that metal pipe is preferred due to its reliability and strength. Here’s a list of our recognized products, we suggest that you review the list prior to culvert installation. The culvert should be placed slightly below the invert or lowest point in the ditch. Consider the implications of ditch maintenance and cleaning by the ministry maintenance contractor. The culvert should be covered with granular material to a depth equal to half the diameter of the culvert. For example, if the culvert is 400mm (16 inches) in diameter, the depth of the cover must be a minimum of 200mm (8 inches) in depth. This amount of cover is necessary to protect the culvert from collapse. Our right of way is often also a utility corridor, so if you are going to be doing any excavation, it is your responsibility to call BC 1 before you dig. Fortis and Telus are the prime 2 utility companies that have underground infrastructure, however there are others on occasion that need to be considered as well. If a head wall or end treatment is required, they will be spelled out on your permit. If there is a ditch in front of your property and the water only runs during the spring, you are still required to put a culvert in. There can be extensive damage to the road and your driveway in a short time if the culvert was not put in place. 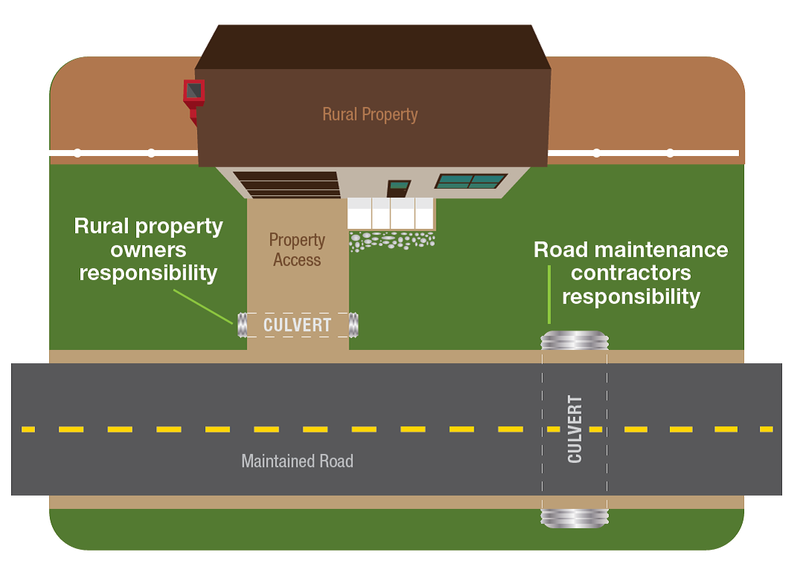 You are responsible for driveway culvert maintenance. Culvert maintenance involves keeping both the inlet and outlet of the pipe free of debris so that it works properly, including removing snow and ice during the winter months whenever possible. Ensure your culvert is constructed of a recognized product. (For example we wouldn’t accept a culvert that is manufactured out of wood). Here’s a list of recognized products we accept. Yes. An individual who has an access point on a BC highway is responsible for all maintenance including clearing snow from highway plowing operations at the access entrance. No. Our maintenance contractors are responsible for clearing the ditches alongside provincially maintained roadways to make sure the water on our roads has somewhere to go. Please note: ditches are not a storm water system for managing private property surface drainage. Surface water on private property should be dealt with within the boundaries of the property, not directed into highway drainage systems. All clear? We hope so. Culverts are an important way to keep water and debris moving smoothly. If you have any other questions about culvert maintenance or anything else the ministry does, let us know in the comments below. I have travelled on this highway quite a few times over the past years. I think it is totaly fine and does not need any of these new implementations that they are proposing. If there is a ditch line alongside a person’s property, they will need a culvert to route water away from their property. If your driveway fronts onto BC highway, the responsibility to clear the plow debris at the end of your driveway is yours. If you live within a municipality, you might want to check with them to see if they offer this service. I find it interesting that everywhere you look it tells you what you must do to accommodate MOTI. What about a property owners right? What responsibilities do they have? Oh wait – it doesn’t matter. They make the rules as they go. We’re sorry to hear about your frustration with this. Rest assured we don’t make up the rules as we go along, and in the case of driveway culverts, the responsibility for installation and clearing, lies with the property owner. If you have any specific concerns, please let us know and we will try to connect you with someone from the ministry in a local office close to you and they will follow up. So, is the access of a driveway mine or public? Like the first few meters between road and property line. Do I have the right to tell contractors not to use my driveway to turn around? There has been numerous occasions where dump trucks are using our driveway to turn around, while working on public works projects. And numerous occasions where they run over the ends of our culvert. Your property begins on the other side of the property line and the ministry (or local municipal jurisdiction) holds the right of way between the property line and the road (and likely the road itself). We can’t say who is at fault for damage to your culvert, and suggest you connect with local ministry or municipal staff to visit your site and determine where the responsibility lies. We hope that this helps. Who do I contact to get a clogged culvert cleared that runs under Lougheed Highway and is Road Maintenance Contractor responsibility? Well, here we are now at September 2018 and still absolutely nothing has been done about my concerns. Homeowners on the uphill side of Gower Point Road should be informed in by publication in the newspaper by either MOTI or SCRD that it is the homeowners job to have the correct size/type of culvert, to keep it open and cleared so water can run freely through it, to direct their driveway water into the ditch instead on to the road, and to keep gravel driveway debris off very busy rural roadways like mine. MOTI should also approve of Capilano rural roadway maintenance, the ‘boots on the ground’, providing written reports of any problems observed regarding culverts and ditches, and of where water is collecting alongside the roadway allowance blacktop to form rivers of water to race to private downhill properties. In the meantime please get the gravel roadside allowance graded properly in front of my home and get the ditches across from my home at 14th and Gower Point cleared ,they are filled with debris. We sent your concern to our local area staff. Our area manager, Colin Midgely will attend the site and review the state of the shoulders on Gower Point Road near your home. When we were there last, we discussed with our maintenance contractor the need to ensure there were swales cut in the shoulder to direct water away from her driveway. Mr Midgley will ensure they are in place. Thanks again for connecting with us here. We hope that this helps. Well, here we are January, 2019 and still NOTHING HAS BEEN DONE to solve the problem as outlined in previous communications. I’m being ignored. I’m disgusted with this lack of follow-through in my personal situation. Water and debris should not be flowing across the road onto my property in ordinary rain conditions, let alone in a deluge. I’d appreciate you making sure to get the ditch and culvert across from me cleared before the next deluge. I don’t want any more visits from anyone, just get the ditch maintenance done. Hello again Rene – thank you for your follow up message. We can appreciate your frustration. We encourage you to follow up directly with the local area manager who has been visiting your site and discussing this matter with you. If you would like their contact information, we are happy to look that up for you? My road floods every spring from hillside runoff. I keep my culvert clear and I’ve paid to have have my ditch scraped clean, but it seems to be the lowest part of the ditch, as the ditch on both sides of mine hasn’t been cleared for decades, which was then done by the district of Vernon. My neighbors inquired about who’s responsible for cleaning out our ditches, and they were told that we, the property owners were responsible for cleaning our own ditches. Nobody is doing anything about it, and my road continues to flood to the point that it’s almost impassible. I think a culvert under the road might be the answer. Who is responsible to follow up on this persistent problem? Hi Dar – have you connected with the City of Vernon? They might be able to send someone out to have a look and advise. I live in Naramata, BC and we are experiencing some serious issues with water. Call it run off call it lack of proper planning, either way the water is flowing down from a development above through driveways, into peoples yards and into basements, saturating septic fields and keeps getting further down the hill. I have contacted the Ministry at 1-800-663-7623 over 8 times, have received prompt call backs 3 times but still no one has come to look at the problem. Water is running so fast down the ditch, which faces East / West, and when it hits a culvert (not on private land) the culver is North / South direction, so some water gets into the culver and lots is going under road into my yard / basement. There is something wrong with this culvert, and there is a wooden bridge built over it?? Which I have mentioned many times on my phone calls. Over the last week many neighbors above who are experiencing basement flooding & lot saturation are now trying to direct more water into this ditch. There is going to be more serious damage if this continues and the culvert put into place is not working to drain the ditches in a compatible matter. HOw can this be addressed, besides being told to call my local fire fighters to put up sand bags? Hello Candiss and thanks for connecting with us here to share your concern. We are aware of the water issues in Naramata and our operations team has been reviewing the situation. We have shared your concern with our local operations manager, Jeff Wiseman and he will follow up with you directly. You can also reach Jeff at 250-490-2227. RE: 1271 Gower Point Road, Gibsons BC V0N 1V3, the runoff water from driveways across, up and over, from me continue to flow at a downward diagonal angle to my side of GPRd instead of into the clearly defined ditch that runs along their side of the road. This collecting water then streams along my side of the crumbling blacktop raceway, carved out by increasingly heavy traffic, streams down the steep earthen slope fronting my property and down my driveway where it continues to the front of my house. On September 2, 2016 I woke to find the grassy front yard of my home a lake and water in the finished downstairs area. Insurance did not cover this overland water damage. Continued complaints, over many years, have not garnered any satisfactory results from the Ministry staff or the local maintenance contractor. This area and the ditch that runs along the entire north side of Gower Point Road should be routinely monitored as per the ‘Residential Driveways Information Sheet’ that clearly spells out up-side driveway owners responsibilities as well as the Ministry and Ministry maintenance contractor’s responsibilities to make absolutely sure that surface runoff water is being directed away from private property. I’m doing my part to the degree that can I afford and I need some cooperation on a moral & compassionate level and well as a professional level from the Ministry. There is a serious problem with the grading of the road along here, correcting the grading to send water into the ditch would make an enormous difference. Please do something. Hello Rene and thank you for your comment. We shared your concern with the local area manager who confirmed he has asked our maintenance contractor, Capilano Services to remedy some of the issues you have raised, specifically cleaning the ditch opposite your property, and creating a flume off the road at 14th street. Capilano have been busy completing some previously scheduled projects for us, but will be moving to this area shortly. Our property is flooding because of culverts that are directing water from the mountain side under the BC HWY directly into our neighbors farms and without proper ditching it just pours onto our properties and is now resulting in property damage. Are they not responsible for putting in proper ditching for the culverts? Whereabouts are you located? We can connect you with the local area manager who may be able to give you some more information or come for a site visit. Do you have some suggestions on keeping a driveway culvert from freezing? Seems like an impossible task in the north. – It is the responsibility of the owner of the access to keep the culvert open. – Ensure that the culvert installed is the proper size, many accesses have a 300mm culvert installed and they freezes easily. 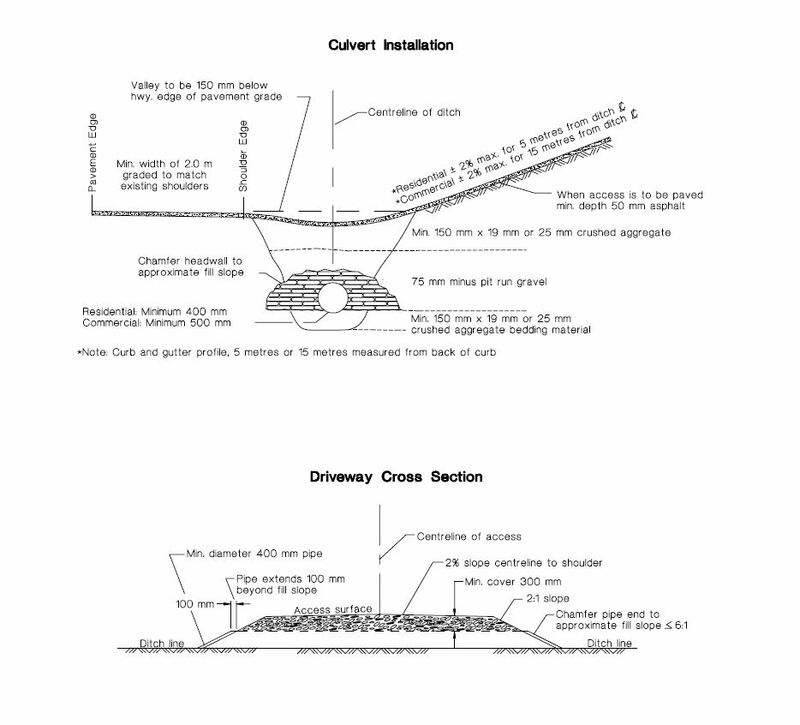 300mm culverts do not – conform to our guidelines for the size of culvert in an access. – Clean the inlet and outlet of the culvert every fall to ensure that they are open and can flow water, residents can flush their culvert with a garden hose or pressure washer as well. – When it snows, do not shovel or deposit snow at the inlet or outlet of the culvert, this way, if the culvert needs to be opened due to freezing then there is less snow in the ditch. – Mark the ends of the culvert so it can be found if it freezes. – You can attach a steam source to melt the ice .. like a pressure washer but from a portable steam boiler. We can’t answer that one specifically, but perhaps you could ask Don via his email? My rural home is on a hillside at the corner of two 66 foot road allowances in the SCRD. The homeowners above me on the other side of the main road do not, and will not, maintain the ditch or the culverts on the road allowance in front of their properties. Rainwater streams down their driveways and onto the road instead of into the ditch. It then crosses the road which cants toward my home and the road allowance that run along side my home. The fast running water carves out & undercuts the blacktop on the shoulder road above and races down the side road allowance & my driveway. The most recent and worst result of this ongoing concern was a small lake in my front yard and a serious leak in my finished basement. The homeowner below me lost much of their recent landscaping and could not drive off their property without having to hire a backhoe.Their home is on a high-bank cliff and water was running over the cliff too. Local road maintenance has been helpful. I’m sincerely hoping you will find someone to look into this further. Are the road allowances within the jurisdiction of the SCRD? Have you spoken with someone in the SCRD directly about your concerns? I have contacted SCRD, MOTI, Capilano Highways & local Road Maintenance, also the Area Director for this location on the Coast, & neighbours. There is a problem along this area of the roadways that is allowing water to flow over and on to private properties. I believe this situation has become a jurisdictional football lost in the ‘chain of command’. SCRD passes to MOTI, MOTI passes to Capilano Highways in West Vancouver, the West Van office passes to the local Capilano maintenance supervisor who passes to a worker (or not) and NO ONE fixes the source of the problem. I am, as is my neighbour below me, being rudely ignored & dismissed and this has been going on for a long a time. The amount of water streaming on to our properties from the road allowances in this small stretch of road could be corrected if MOTI would provide well defined instructions to local road maintenance for ongoing care in this location. Question: Who, with the knowledge, skill, & some authority (not just a monitor) will meet with me & my neighbour on some very rainy days to visually assess & promote this problem up the chain of command for corrective road maintenance? Thank you. Thanks for the extra information. We have sent your request to the district office for review. Stay tuned. We sent your comment to the MOTI office responsible for the Sunshine Coast. Thanks! We understand that one of our staff contacted you directly via email to set up some time to visit your property before and during a rainfall event. We hope that this helps. Please let us know if you need anything else. I’m having trouble finding the right place for info on side hill water control, and responsibility for it. I have land bound by two parallel roads about 100 feet apart. On the high side of the first road, there is a ditch and culverts which direct the uphill ditch water under the road onto my property. All good so far. However, when the water crosses the property and tries to pass under the second road (old rail bed converted to walking path, with no apparent culverts but possibly French drain system), it is unable to do so effectively because of brush and annual leaf litter buildup. There has been no maintenance along the toe of the slop on this second road. This has caused the water to pool and backup into my property which has become a surface water retention pond and is chronically wet. Livestock have been kept in this area for over 70 years, but it’s now too wet to use. Where should I look for legislation that defines responsibility … is this my problem, or should the municipality be accountable? many thanks for the contact info. Will do. c.
We have a ditch in front of our property. The accumulation of water in the ditch is virtually non-existent even in heavy rains as the road slopes to the opposite side which has no ditch. The ditch is over 4 feet deep in some spots, we see this as a danger for people traveling down the road as there is no shoulder. The property’s up the road have no ditch just a swale. Also the ditch has not been maintained and is over grown with trees and brush, which will become a fire hazard in the heat of the summer. Other properties in close proximity have a swale of 1′ deep. If it were a swale rather than a ditch we would be willing to maintain it. Thank you in advance for your attention to this matter. Could you let us know your approximate location? We would like to connect you with your local area office directly for further discussion. I definitely agree that maintenance for these pipes are crucial, so the insight you give about this was helpful. Specifically, you talk about how this involves keeping both the inlet and outlet of the pipe free of debris so that it works properly. Not only will this keep the pipe functioning, but it will help you to avoid any type of additional issues that you would have to clean up and pay for. Thus, doing this maintenance regularly will ensure that the pipes are always functioning and no damage or harm comes from them. Thank you for sharing! Glad to hear you liked it Lauren! Thanks for connecting with us here.